Heel Spurs and Plantar Fasciitis are closely related although they are not the same. Plantar Fasciitis is the inflammation of the plantar fascia while heel spurs is calcified bone deposits that can form on the heel. Approximately 70% of patients who suffer with Plantar Fasciitis have heel spurs. 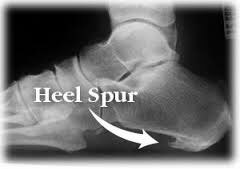 Although many patients who have heel spurs may have no pain. Heel spurs is common in people who have a history of foot pain or Plantar Fasciitis, but they are most often seen in middle age men and women. However in most cases a custom made foot orthotic with either cushion support or specific heel pads will be recommended to help diminish the pain and discomfort associated with heel spurs. Shockwave Therapy can be very effective in treating heel spurs. If you have any questions about Heel Spurs, contact our staff at Dynamic Physiotherapy.